As indicated in the title, this watch differs from the standard Sinn 856 UTC in black as it does not have a dual time zone complication. The result is a clear, easy to read dial which resembles the smaller Sinn 556 A series in a larger case size (40 mm) which is Tegimented. 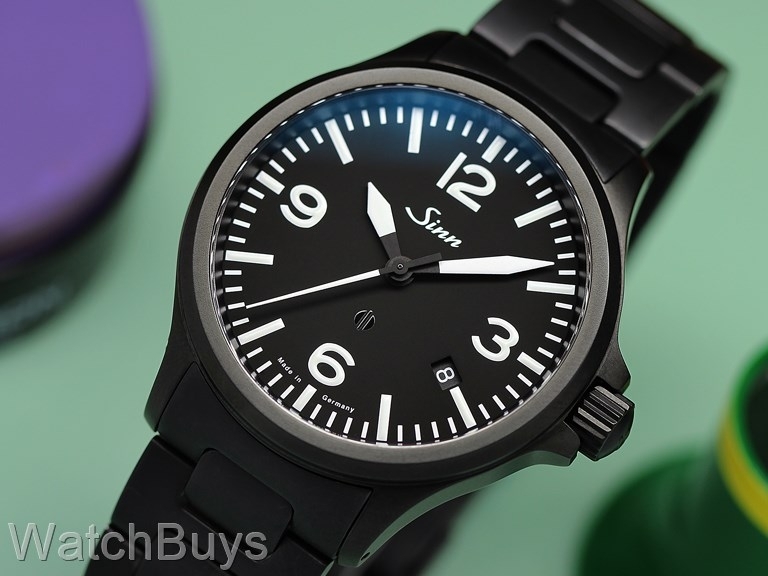 The Sinn 856 Black on bracelet capitalizes on all that's great with the standard Sinn 856, but adds a black case and bracelet created with Tegiment PVD technology. This watch features "Tegiment" technology. Standard steel used by most watch companies has a hardness of between 200 and 240 HV (Hardness Vickers is a common scale used to measure material hardness). The Tegiment layer has a hardness of 1,500 Vickers which is up to seven times harder than standard steel. Sand-blasted stainless steel case with black Tegiment PVD technology and solid back. Dial is matte black with Arabic numerals and offset date display at 4. The design and layout of this watch make it extremely easy to read in virtually all light conditions. Sapphire crystal with luminous hands and hour markers. Watch is water resistant to 20 ATM. Stainless steel bracelet which is PVD black and is fully Tegimented. Verified Owner Comments: I absolutely love this watch. Debated this and the UTC but chose this one for the cleaner look. The black-on-black tegimented is especially clean looking serving as an excellent contrast to the white dial markings. I've had it for a couple of weeks now taking it some International travel and not a scratch! Verified Owner Comments: After owning this watch for 7 months, I'm confident in saying that it's exceeded my high expectations. Highly functional, solid construction, and very attractive. I wear it daily and it has almost no signs of wear despite the occasional accidental impact on hard objects. I would buy again and the customer service from WatchBuys was outstanding.